4 Beds 3 / 0 Baths 1,839 Sq. ft. 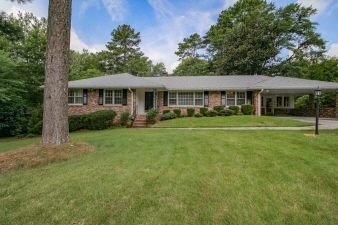 Description: Solid 4 sided " Old Brick" sprawling Ranch, MC Honea Resale, Lakeside Hi, Emory, CDC, desirable intown neighborhood, Short Distance I85 Lenox square/Brookhaven, Lots of charm with Knotty Pine Wood Paneling , Beautiful refinished hardwoods throughout, Inlaw suite, w/ bedroom & bath on Terrace level, Kitchen w/ breakfast nook & bay window, Den w/ Brick Fireplace, 1 step down leads to beautiful level fenced backyard, Charming Sun room overlooks established landscaped Zoysia lawn, Carrier gas furnace and AC 2015, Updated Roof, Custom Installed Gutter Guard 2015.